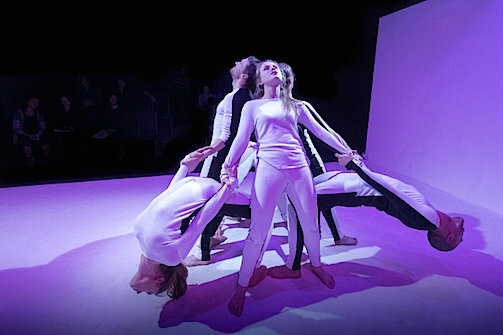 BOTTOM LINE: Using physical theatre in the style of Grotowski and Meyerhold (where actors use movement and gestures instead of words to convey emotion or a concept), combined with sourced and original text and song, the ensemble and creative team weave together an original work of experimental theatre. The piece is bold and brave, but it’s not ready to be taken out of the oven. In the director’s note in the program, we learn that director James Rutherford had been working on a production of Miss Julie but that plan “fell apart” leaving him with producers, a creative team, and cast ready work, but no project to work on, so instead they all came together to build something new. Unfortunately, you can tell that this piece is an improvised plan B (albeit, a plan B that has been ‘Frankenstein-ed’ by an extremely deft and talented group of artists). There is no beginning, middle, and end of a plot for me to summarize for you here. The audience enters a stark black theater with a painted white space in the middle for the action. The lights go out and the entire theater is dark and silent for a while then we start to hear the backstage rumblings of the actors. The rumblings rise to an orchestrated cacophonous frenzy and then the actors enter and present a series of vignettes. All That Dies and Rises isn’t a play with a story and linear narrative that is to be followed intellectually, it’s more of a visceral experience and it’s comprised of mostly what looks like acting exercises and warm ups mixed in with modern dance. In addition to the movement based work, the piece is sprinkled with powerful text (sourced from the works of Strindberg, Dostoevsky, Catherine Valente, Gertrude Stein, Anne Carson, Aravind Adyanthaya, Fanny Howe, Charles Bukowski, Jon Froehlich, and Grace Paley) and song (the singing is enchanting). There is also a lovely scene toward the end of the piece that has dialogue between a dying father and his daughter. All that Dies and Rises is very self-aware and at times even pokes fun at itself for being the kind of theatre that makes some people afraid or uncomfortable with its unconventional style and beginning. While I applaud the show’s courage, I feel as though most of its physical storytelling is missing its mark in the same way a bad actor would speak his lines “at” someone instead of “to” someone; however, there is a stand out piece of movement choreography that is powerful, purposeful, and memorable in which a man and woman come together in a sweet and beautiful way and connect (literally, physically connect as they lock arms and are back to back) and then can’t find their footing or agree on a direction to walk in. In a way, I feel as though that is exactly what happened to the inventors of this show. In The Myth of Sisyphus Camus says, "Thinking is learning all over again to see, to be attentive, to focus consciousness; it is turning every idea and every image...into a privileged moment." I believe if you replace “thinking” with “physical theatre” you will capture the spirit behind what the fearless creators of All that Dies and Rises wish to provide to their audience. And while there are privileged moments, they are few and far between.